I belong to the generation that valued Marvin Kalb’s journalism on the Soviet Union. When I heard that he had written a book on the Russian-Ukrainian conflict, I looked forward to reading it. My interest increased when I listened to an online presentation at the Brookings Institution in which he said that before writing the book he had looked at the region solely through a Russian prism. He also maintained that in researching his book he had become convinced of the need to examine long-term historical factors. On a trip down to Washington, I was pleased to pick up a copy at Kramerbooks, one of the few independents left. 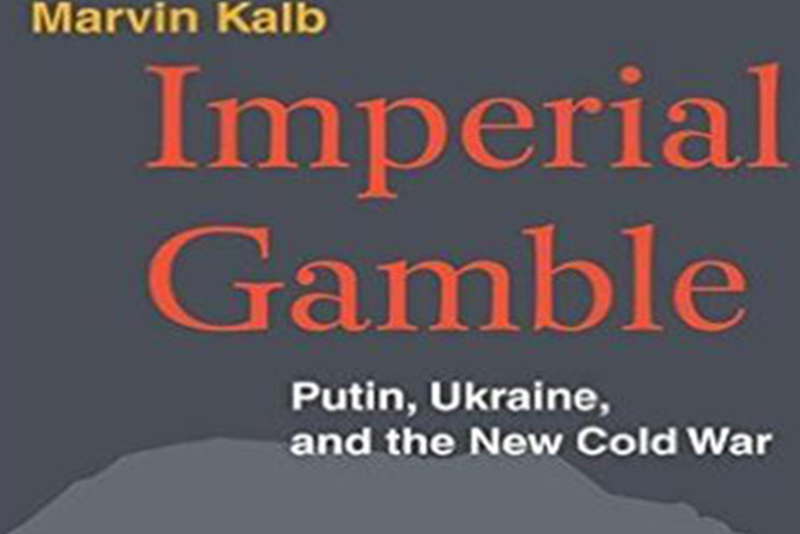 Looking at the introductory chapters, I learned that Mr. Kalb had studied as a graduate student at Harvard under the prominent historian of Russia Michael Karpovich. Hence arose my expectation that this Brookings Institute Press publication would offer not only more history, but more accurate history than most journalistic accounts. As specialists in Eastern Europe or World War I and its aftermath will know, rather than backing the Western Ukrainian National Republic, the newly formed Polish state engaged in a bloody war in which Polish losses are estimated at 10,000 and Ukrainian losses at 15,000. That war long poisoned Polish-West Ukrainian relations. They will also know that the “eastern Ukrainians” did not march into Lviv on November 1, 1918, or any other time during the Polish-Ukrainian war, and that no one in that war was backed by Moscow. It is not only Polish historians who will know about the “Miracle of the Vistula” and the defeat of the Red Army at Warsaw (after all we have Norman Davies’ excellent book White Eagle, Red Star). I doubt any reader will figure out why Petliura’s forces are called “western” Ukrainians. I don’t see the need to catalogue the inaccuracies that undermine the authority of Mr. Kalb’s vision of and policy proposals on the Ukrainian-Russian relationship and conflict. I rather draw attention to his book as belonging to the recent works on Ukrainian affairs by Russian specialists and watchers who do not fully examine Ukrainian history and viewpoints before making statements and generalizations. They especially miss the transnational nature of Ukrainian history. By the very need to examine the many states and rulers that have controlled the territory of Ukraine or the lands on which Ukrainian speakers dwelled, Ukrainian history is transnational. Historians of the Russian Empire and the Soviet Union frequently look at Ukrainian history from the Russian perspective, paying little attention to the Cossack Hetmanate and even less to Ukrainian territories not in Russian states (whether the Grand Duchy of Lithuania, the Kingdom of Poland, the Habsburg Empire, or interwar Poland or Czechoslovakia). This tendency occurs not only in journalistic and popular writing but even in scholarly works (I have recently reviewed a book dealing with Ukrainian territories in the Russian Empire by a major university press that contains mistakes of a comparable order on Ukrainians in the Habsburg Empire as those quoted above). I am puzzled about the review process of the influential Brookings Institution Press. Valentina Kalk, director of the Press, commissioned the book. Still I assume it went through the normal review process. Is it possible that any specialist in Ukrainian history and studies let through errors of this magnitude? Is it that none was asked or none agreed to review the manuscript? Certainly the greatly increased number of works on Ukrainian topics in English has taxed the reviewing capacity of the limited number of specialists in the English-speaking world. I hope this was not the reason that the book does not appear to have received a proper vetting. When Mr. Kalb studied with Karpovich in the 1950s, the scholarly literature in English on Ukraine was quite limited. Since then scores of monographs and translations have appeared. For information on Ukrainian history readers can read the works of Subtelny, Magocsi, Yekelchyk, and the recent The Gates of Europe by Serhii Plokhy. They can always turn to the online Encyclopedia of Ukraine for factual information. However, many will assume a book recommended by Henry Kissinger, Nina Khrushcheva, and Josef Joffe and published by the Brookings Institution Press is authoritative. Mr. Kalb argues that an examination of history should shape our views and policy on the Russian-Ukrainian conflict. This makes an evaluation of his discussion of Ukrainian history all the more important. I wonder what my colleagues think of this book and of the general state of publishing in Ukrainian studies.